Keurig’s K55 is a more affordable, more feature-heavy version of the K50. If A plus B equals C, it’s a better coffee maker. The math on that is pretty simple. Or, is it? While the K55 does more in the sense of self-cleaning and maintenance, it also has a worse track record for reliability. The K50 keeps churning out delicious drinks, while the K55 stops working for reasons that can’t be easily discerned. The question is: which is more important in determining which coffee maker is superior? The K50 is basically just an older model of the K55, so the performance is nearly identical. Both permit users to choose a variety of K-cup pods from a variety of roasters, and users can choose the strength and size of their blend. Because of that, performance is a draw. The K55 is slightly more affordable than the K50. Comparing two of what are basically the same model of anything based on price comes to a simple number, and in this case that number is on the side of the K55. We’ve read a lot of reviews for both models to help users get an idea of how these things work in wide distribution. Based on a wide range of experiences, the K55 has durability issues that the K50 doesn’t have. That might sound weird, but the K55 also comes with features that the K50 doesn’t, which means there’s simply more that can go wrong and cause the coffee maker to not work. The K50 gets the nod here. Proper operation requires that a coffee maker be cleaned and descaled of calcium deposits regularly. To keep your K50 in top running condition, you need to do a little elbow work. The K55 comes with a descaling feature that is simple to operate. That’s a major difference in features between the two, and it’s enough to give the nod in this case to the K55. This machine is a twist on the classic K50 design that permits descaling with the push of a button. It’s compatible with dozens of coffee roasters with hundreds of different strengths and flavors. However, it trades in a little bit of durability for that. On the other hand, it’ll knock a few bucks off the price you pay for it. The K50 is just a straight-forward coffee maker. The only bell and whistle it comes with is that it’ll shut itself off after 30 seconds. It’s a little more expensive, but also a little more reliable than the K55. You read reviews written by so-called experts and think that while they’re nice, ultimately they’re just the opinions of one person or a small group of people. What about the masses, you ask? How would the experts’ opinions stack up against a collective created either through crowdsourcing or by consuming online reviews? We dig. Actually, we dug. We dug through the websites to see what the Internet had to say. Since both these coffee makers are basically the same model, their online reviews were both pretty similar. 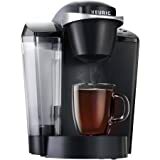 Since Keurig has sold thousands and thousands of both models, both the K50 and K55 are fairly popular coffee makers. The most popular feature was simplicity. Stripped away of the brand mystique, both are very simple machines. Both are simple to set up, and both are simple to use. Pull them out of the box, fill the reservoir with water, plug in a K-cup pod, and press a button. People really liked that about both and really liked that both were fast. People also really liked the variety of flavors and roasters available. It wasn’t just the coffee. It was also the variety of different kinds of drinks, from waking up to a nice breakfast blend roast to brewing chai tea on a chilly fall afternoon. Simplicity. Variety. Speed. These are things people really liked about both the Keurig K50 and K55. What didn’t they like? To start with, noise. Users complained that both models were too loud. They might be simple. They might brew quickly. They also brew loudly. The K55 was also dogged by complaints that it’s just not very durable. It works fine to start with, and then one day, for no apparent reason, it no longer works. For some reason, the same complaints didn’t apply as widely to the K50. There were still people who complained about it breaking more quickly than it ought to, but not to the extent that they did about the K55, which is strange because the K55 is an updated version of the K50. We were surprised to come down on the side of the K50. Both it and the K55 can brew the same wide range of coffee roasts and flavors. Both are fast, and both turn themselves off when not in use. The K55 is a little lower-priced and has push-button descaling. We expected that to make the difference between the two. However, it just feels as if in adding a couple of push-button features, Keurig overlooked what people want. People really just want to wake up in the morning and quickly make a cup of coffee. That’s not possible if their coffee maker isn’t working. The K55 is a great coffee maker, but we felt that Keurig traded durability for features that just aren’t all that important, so we have to give our nod to the K50. Keurig K50 vs K200: Which One’s Best?